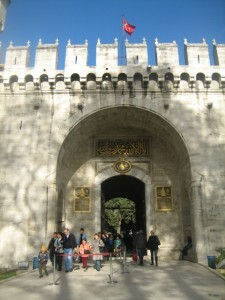 Since we arrived in Turkey, I have been reading books about the history of Turkey and the Ottoman Empire. 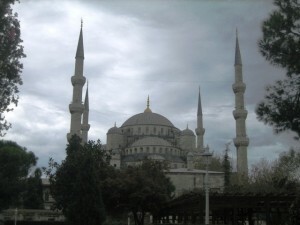 Istanbul, formerly known as “Constantinople” plays a prominent role in both ancient and modern Turkey and we planned a few days there enroute back to the States in late November. Since Turkish Air wouldn’t accept Jolie in the cabin (a long story), we had to hire a car and driver to make the 12 hour trip that took us from the southernmost coast of Turkey to Istanbul. It did give us a chance to see some of the country side and appreciate the amount of money being invested in the Turkish highway system which is impressive. East meets West quite literally in this world class city. 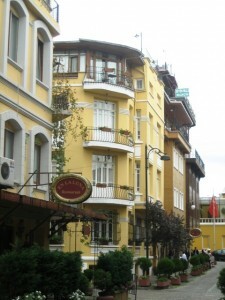 We stayed in a small hotel in the Sultanmehnet area of Istanbul on the European side of the Bosphorus. The charming neighborhood of cobblestone streets included the Four Seasons Hotel, just a half block away and numerous shops and restaurants. 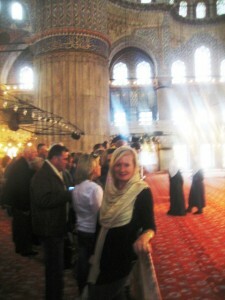 Our hotel was perfectly situated just a five minute walk to the main Sultanmehnet sites: The Blue Mosque, Hagia Sophia and the Topaki Palace. 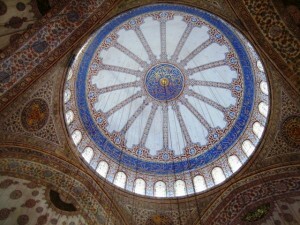 The Blue Mosque was built between 1609 and 1616 and has six minarets or spires. 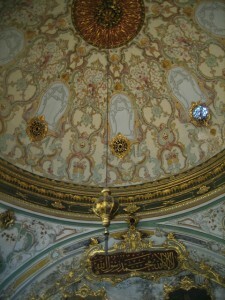 It reflects the glory of the Ottoman Empire. 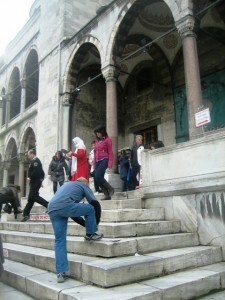 Shoes are carried in bags snd put on once outside the Mosque. . .
and women are asked to respectfully cover their heads, although not everyone does. 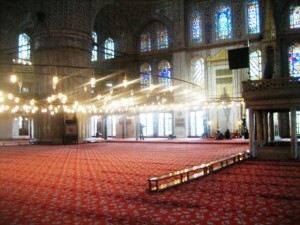 Between prayers, the Blue Mosque is empty except for visiting tourists. 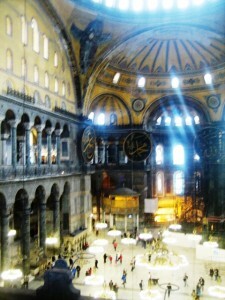 . .
but the majesty of the building commands a quiet reverence. 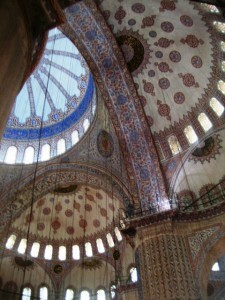 with soaring columns and brillant domes. Hagia Sophia, situated just a short distance from the Blue Mosque is the most renowned Byzantine Cathedral and dates back to 360 A.D. Hagia Sophia meaning “sacred wisdom” was the name given to the church in the fifth century. The church has sustained much damage over the years from earthquakes and conquerors. The conquest of Constantinople by the Ottomans led to restoration of the church but conversion to a mosque with minarets being added to it. 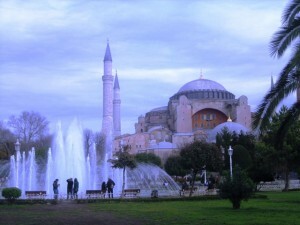 In 1934 Hagia Sophia was made a national monument and became a museum. 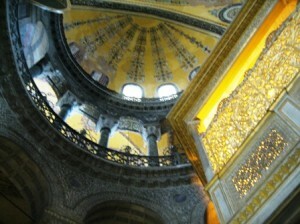 The interior of Hagi Sophia is of grand scale and. 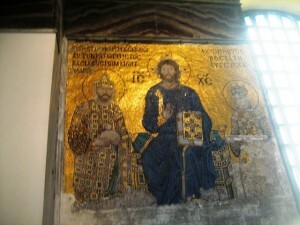 . .
has beautiful gold mosaics that were once covered with plaster. 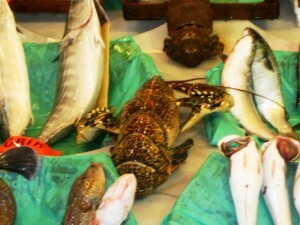 In the two short days we had we confined our “touring” to the immediate area but saw all the major sites in Sultanmehnet, including the Grand Bazaar and the Fish Market which reminded us of Seattle’s famous fisherman’s wharf. 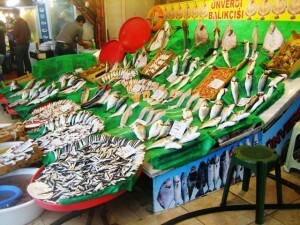 The Istanbul Fish market had more fish than we have seen anywhere in the Med. . .
even a New England style lobster. 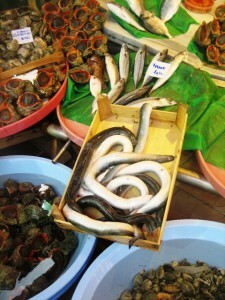 . .
and eels, which are considered a delicacy. 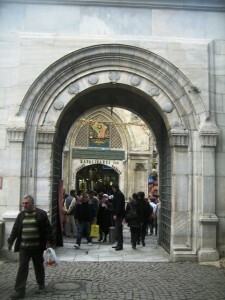 Istanbul is home to one of the largest and oldest covered markets in the world. 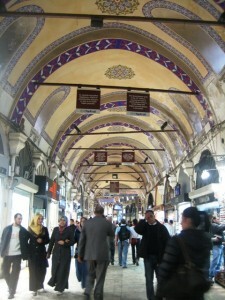 This ancient “mall” dates back to 1461 and houses over three thousand shops. 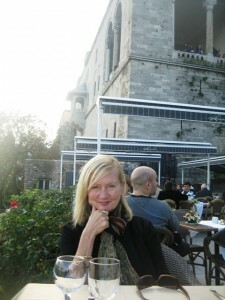 We celebrated my birthday on November 27th visiting the Topkapi Palace and lunching at an elegant restaurant overlooking the Bosphorus. 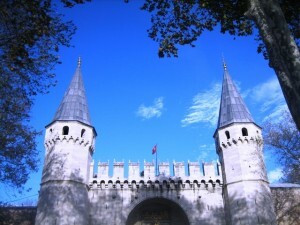 The Topkapi Palace was first completed in 1478 but has had additions made to it through the years with the latest in the mid-19th Century. 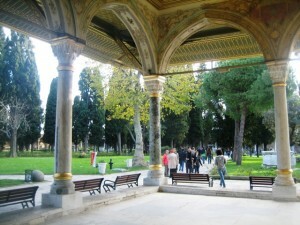 It is an elaborate complex of formal and private rooms including dormitories and barracks, not to mention the harem. 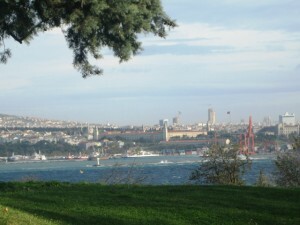 . . .a view of the Bosphorus from palace grounds. Unfortunately, there were restrictions on photographing much of the interiors of the palace, with its extraordinary collection of ornate jewelry, weapons and other treasures. 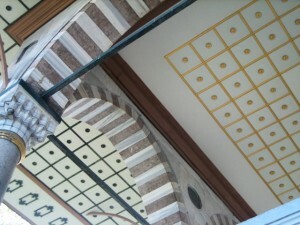 The architecture gives some indication of the concentration of wealth represented by the Ottoman Empire. 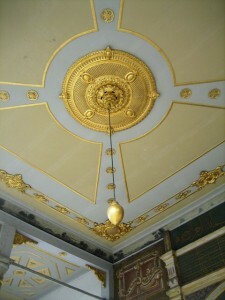 Inside the palace gold leaf abounds. 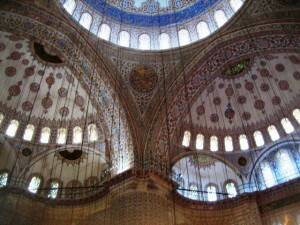 . .
and the architecture has an exotic appeal. Many of the palace rooms are like little jewel boxes. 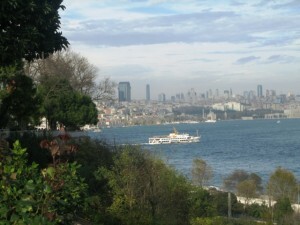 From the palace you see modern high rises of Istanbul. Lunch at the palace for my birthday. 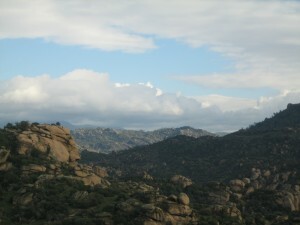 . .
included a spectacular view. 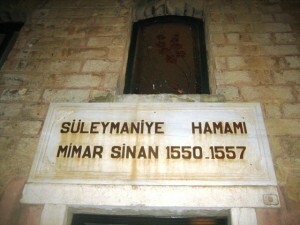 . .
With a flight that required us to get up at 3 a.m. we opted for visiting a 500 year old Haman for an authentic Turkish bath as a finale to my birthday celebration. After being steamed, scrubbed and massaged with bubbles we slept like babies until the early morning wake-up call. 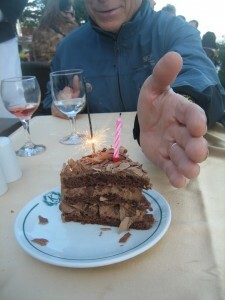 A very memorable birthday indeed. 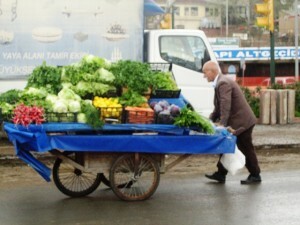 Istanbul has an allure that is hard to describe. 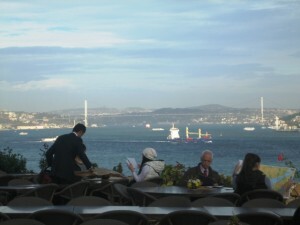 It is a city of contrasts, as one might expect from the fact that it straddles two continents. One of several bridges that link east to west. We had just two days to explore a city that could easily take weeks to discover. 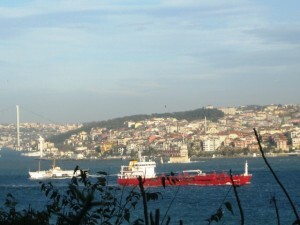 We have decided that taking our boat up the Bosphorus and venturing into the Black Sea may be on the agenda. We’ll keep you posted.